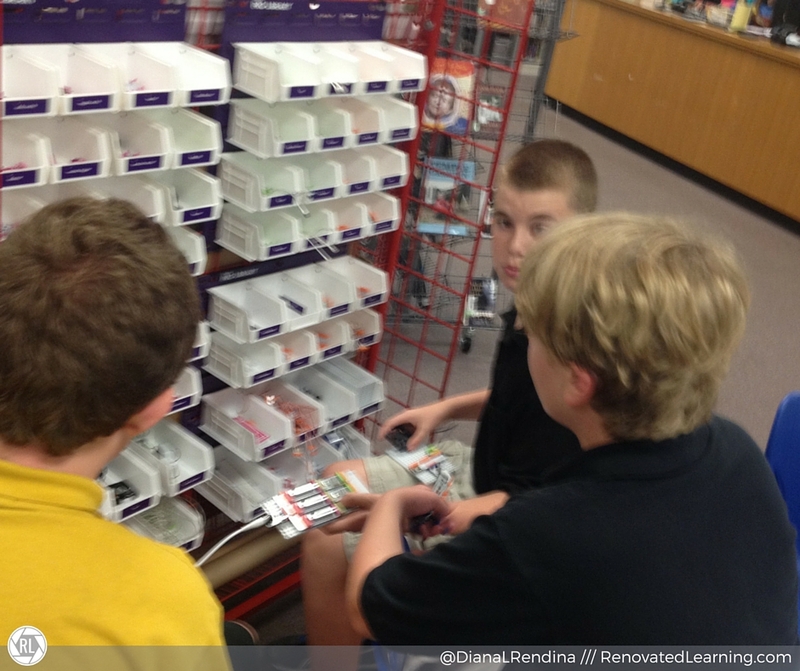 Back in the summer of 2014 when our makerspace was really starting to take shape, I won a littleBits ProLibrary in their Summer of STEAM contest. The library came with the now optional wall storage but I knew that I didn’t have a wall space where I wanted to put it. I wanted to be able to secure the bits when I was out, but also to be able to monitor students as they were using the bits, and there just wasn’t a good place for them at the time. So I had to get creative in finding a new solution. Storing our ProLibrary like this made it easy to put all the bits back when we were done, since every bin was labelled. 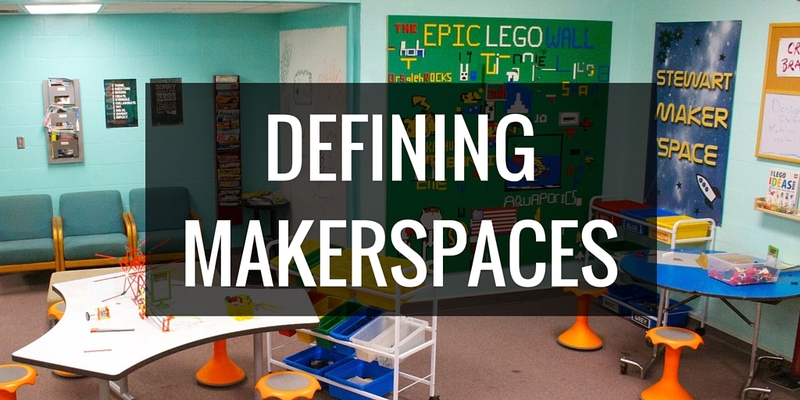 We could easily bring the entire library out to the library floor for tinkering. The ProLibrary has a LOT of bits, and some of my students were too overwhelmed with the options and didn’t know where to start. The cart was pretty big, so even though it was mobile, we didn’t actually bring it out that often. 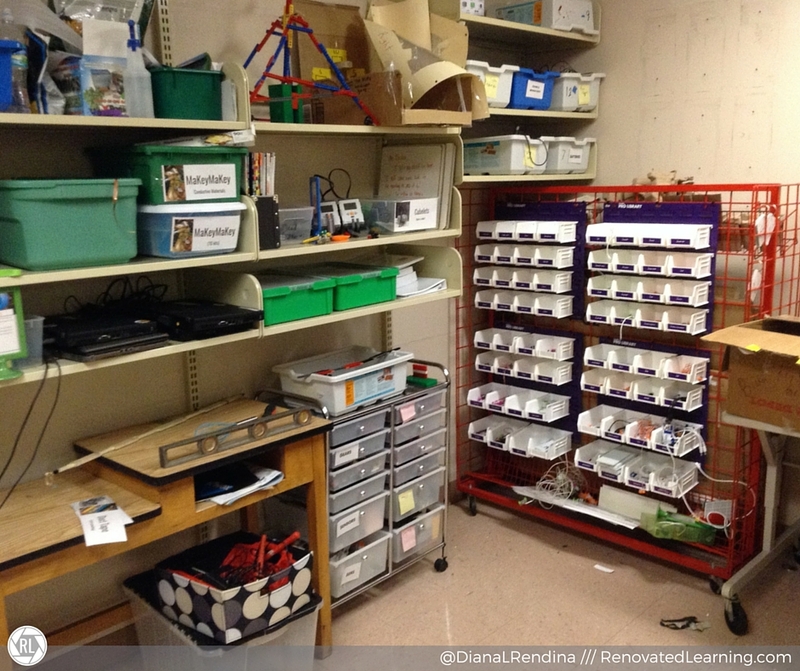 Some students would grab a few bits, try them out, and then not put them away, leading to broken bits on the floor. We ended up having quite a few bits that were lost or broken since they were being stored so out in the open (in the Maker Room). Seriously. At first, I didn’t label where the bits went and after we brought out the tackle box just once, it was a disaster. I personally love this Brother label maker as it has lots of fonts, symbols and color options, but any good label maker can work fine. The ProLibrary includes several Synth kits, Logic bits, CloudBits and ArduinoBits. While these bits are awesome and amazing, I had found that including them with all the other bits was confusing my students. When my students are first learning how to use littleBits, there’s a lot of tinkering and not a lot of instruction reading. So they were getting frustrated when they would attach a bunch of LEDs to a CloudBit and they weren’t lighting up (because they didn’t realize they needed to program it). I’ve organized and stored those kits separately in the Maker Room now and I’ve included a note inside of the tackle box to see me if they’re interested in those kits. This kind of goes along with what I just talked about. 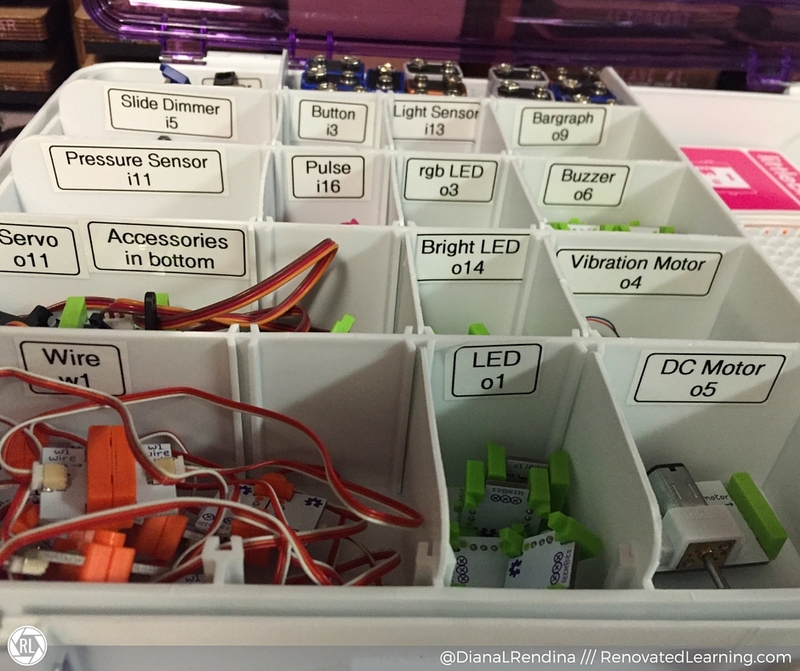 My goal with the tackle box is to get kids interested and tinkering with the littleBits, then moving them deeper. I want them to have early successes, not get quickly frustrated from some of the less obvious bits. So in the top, I keep things like power bits, batteries, cables, LEDs, Servo, wire, buttons, etc. I haven’t actually done this yet, but I got the idea from Collette J. and I’m excited to try it out. I’m going to print out and laminate pictures of the bits from littleBits’ website and then attach them to the bottom of the corresponding sections. I think this will help out my visual learners. Recently, I’ve gotten kits like the STEAM Student set (my review here) and the Gizmos and Gadgets kit. I’ve kept them in their boxes so far, but I’m already seeing a lot of wear and tear as students have used them. I’ll likely just consolidate them with a few more kits into another littleBits tackle box and include the accessories and instructions in the large open section. Another possibility I’m considering is getting a Plano Stowaway tackle box for each individual kit and attaching a pocket to the box to hold the manual. But I don’t think the accessories would fit, so it might take some experimentation. 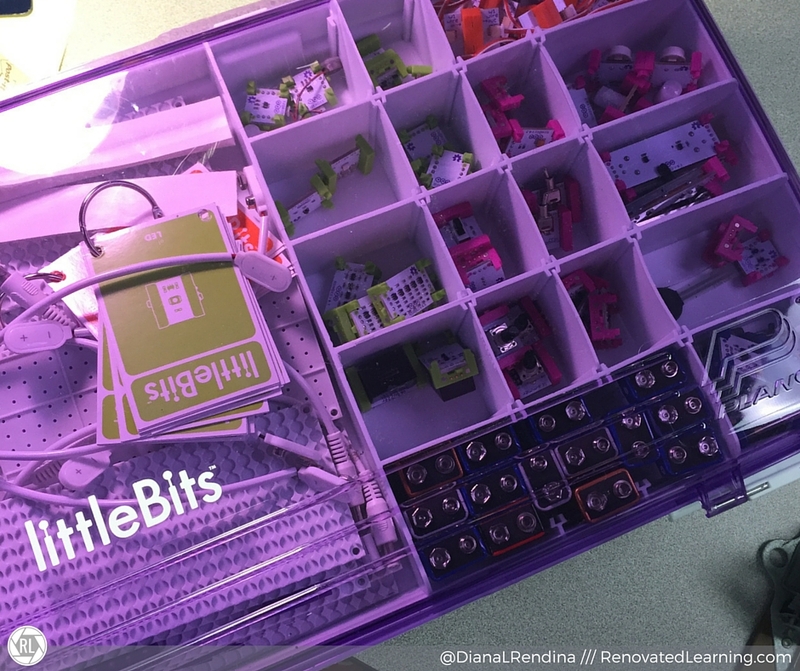 Do you have littleBits in your library? 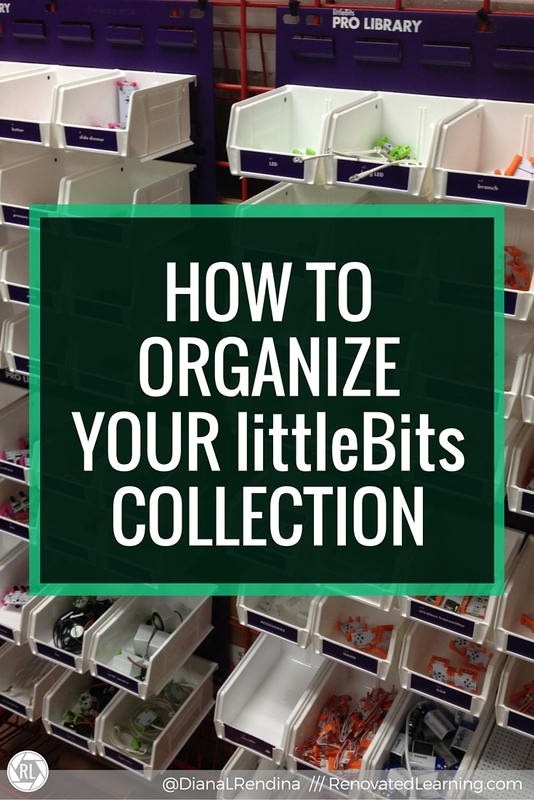 How do you organize your littleBits? Want to hear me, David Saunders and Christine Leonard talk about all this and more? 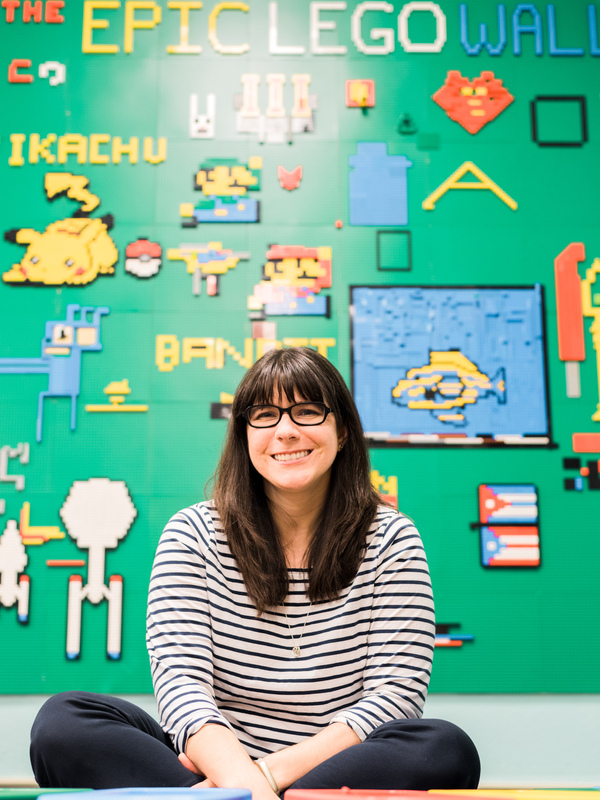 Check out our webinar with littleBits and School Library Journal on Thursday, April 21st at 3pm EST. Click the image above to register. I use the tackle box! I labeled each section with the bit’s name, then created a map that I taped to the top of the bottom section that shows the picture and name of each bit and the section it goes in. The kids (4th graders) have done an incredible job keeping them organized and the legwork ahead of time was WELL WORTH IT!! I have been contemplating this exact topic, how to store the Little Bits. I currently have 3 kits and had been keeping them in their boxes. At the end of each class I would tidy up and resort the bits. That got to be monotonous and when the boxes began showing wear and tear I began moving forward. I currently found a tackle box like system for storing magnetic letters. The bigger pieces and accessories don’t fit but they are temporarily stored in the Gizmos and Gadgets box. I had thought about getting a tool drawer system similar to the pro library but am afraid of more problems as explained above. With my current tackle box scenario I have yet to label the compartments as I had viewed this situation as a temporary fix. At first, I left the kits in their boxes. But I knew that there was a better way to organize them. I bought the tackle box and since I don’t have a label maker, I just printed them out on DEMCO spine labels. They’re a lot more organized, but I wish that I was able to put all of the manuals in there too! I use the little Bits Tackle boxes. I like the idea of using labels and possibly pictures. I also have some smaller organizers from Michaels that Correspond to each of my tackle boxes for when I want to limit the bits available. http://www.michaels.com/papercraft/craft-organization/809188640 is what I use for the smaller organizers.